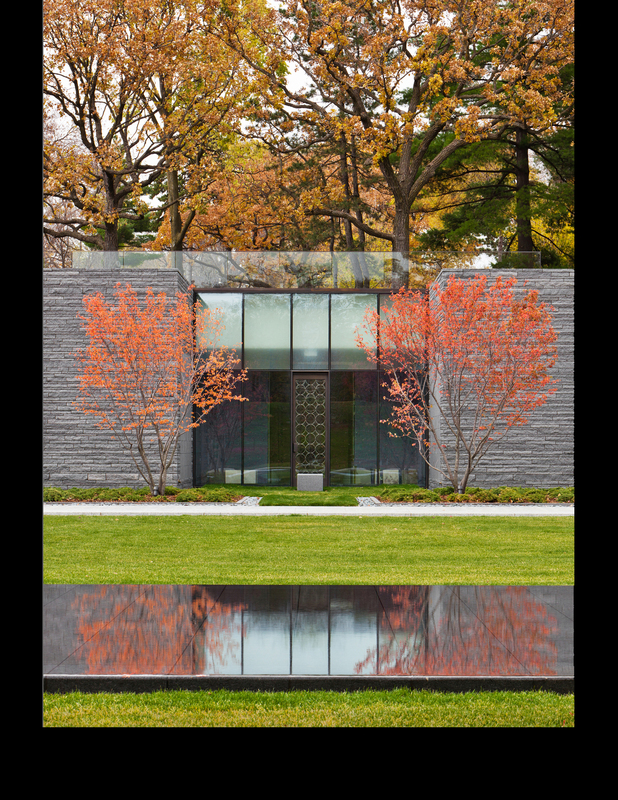 Image: Halvorson Design Partnership, Inc.
A new mausoleum and reception center is nestled into the existing slopes of the space. From the street, the building mass largely fades from view with only a 5,500-square-foot granite pavilion visible among the preserved specimen Oak trees. 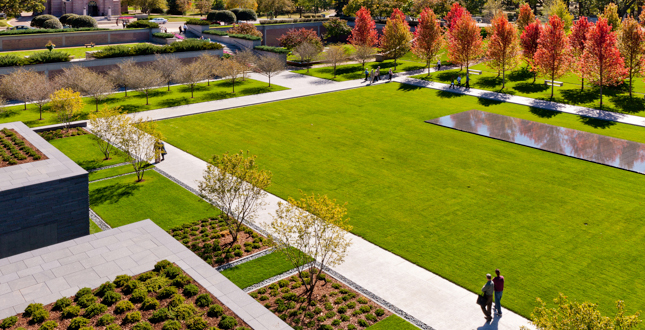 A large central lawn anchors the space and accommodates Memorial Day events for upwards of 350 people. Comfortable, contemplative spaces have been designed around the perimeter for more intimate gatherings. 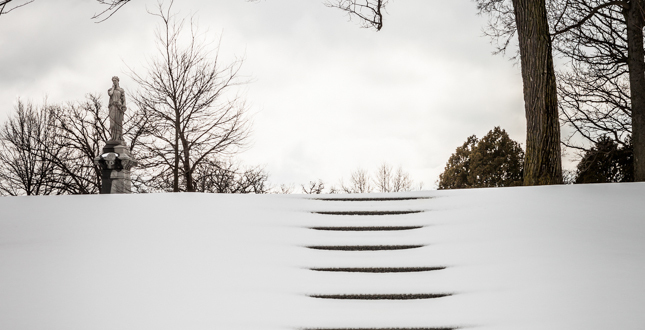 Spectacular views to Lakewood Cemetery's chapel beyond have been preserved. The new reflecting fountain is a zero-edge pool with a 1” deep “scrim” of water over a layer of pavers on pedestal mounts. When drained in the winter, it becomes an active plaza space. Mature trees were preserved through air spading, root pruning and shoring with sheet piling in order to build the back wall of the mausoleum. 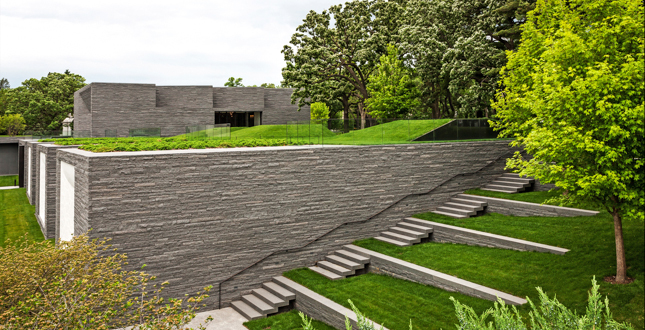 Terraced walls ease the transition between building and landscape and offer opportunities for future memorialization. 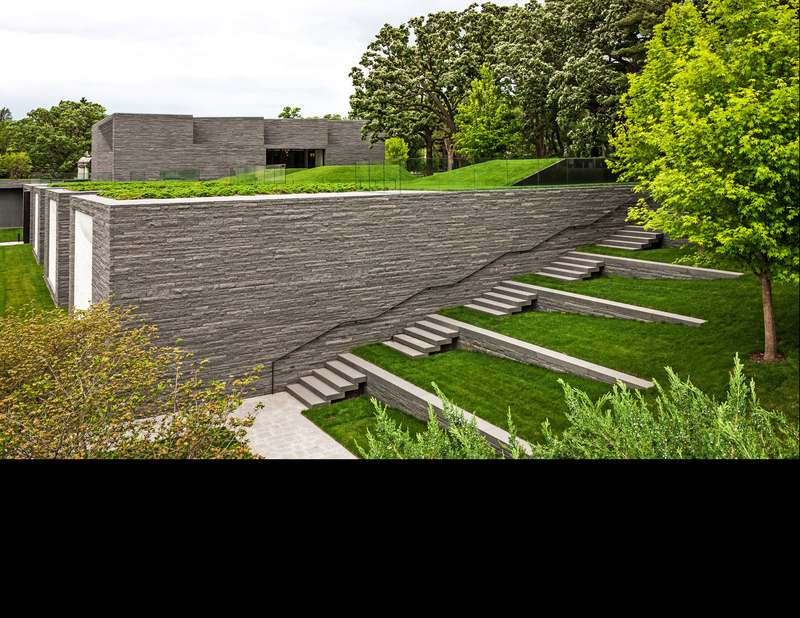 The green roof allows the cemetery’s “Lawn Plan” aesthetic to seamlessly extend to a newly created overlook. The union between architecture and landscape is epitomized by the bronze framed earth forms containing skylights to the crypt rooms below. The new garden mausoleum at twilight. The low ground plane focuses attention on the powerful mosaic motif around the windows. 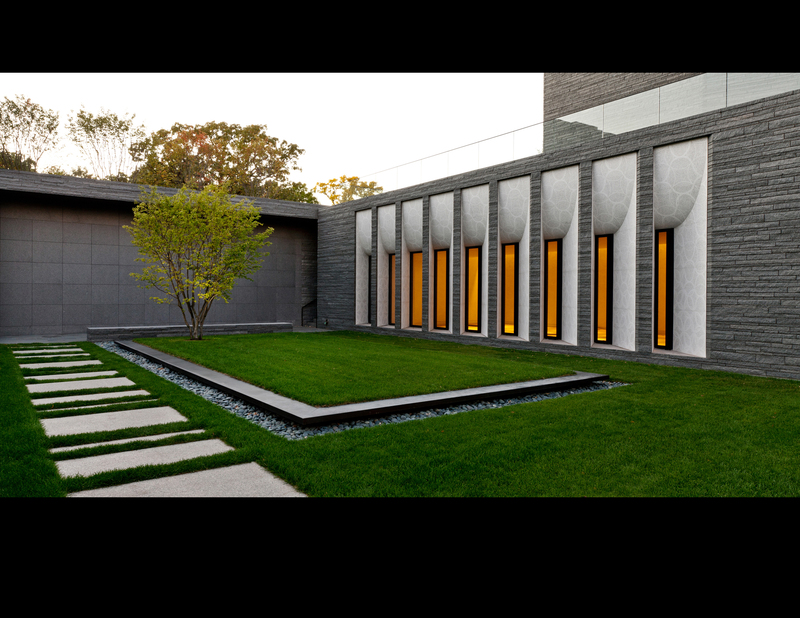 Exterior columbarium niches are designed between the projecting crypt rooms permitting interment in a garden setting. A view of the new garden crypts outside the commitment chapel windows. 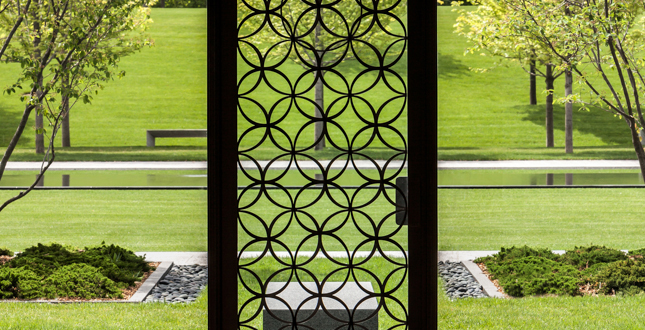 The elevated lawn panel is reminiscent of family plots within the Cemetery grounds. The Serviceberry tree derives its name from its delicate blossoms, which signified to early American colonists that the ground had thawed enough to dig graves and have burial services. River stones collect runoff to a below grade infiltration system. Circulation was shifted away from the building to allow for the creation of a series of sacred zones defined by raised bronze or granite curbing. 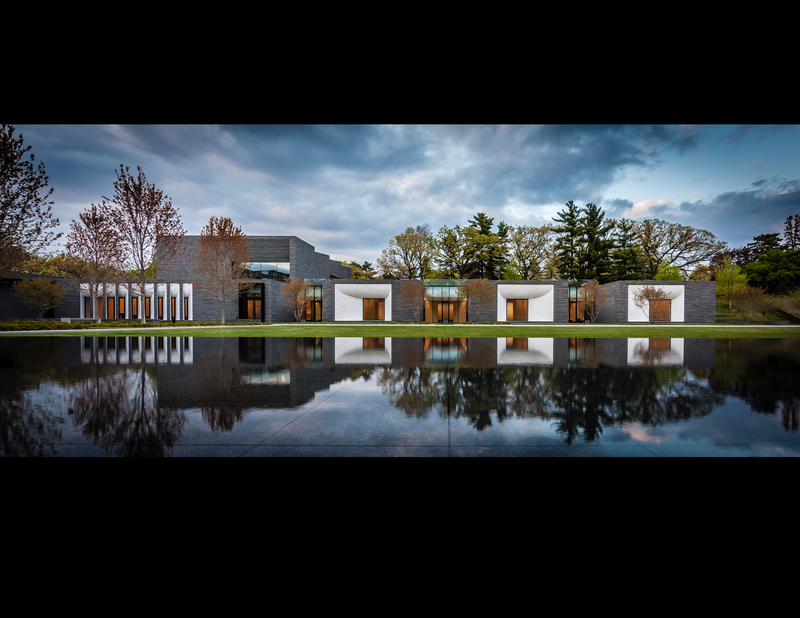 View from beyond the reflecting pool into one of the exterior “Garden Niche” rooms for memorialization of ashes. 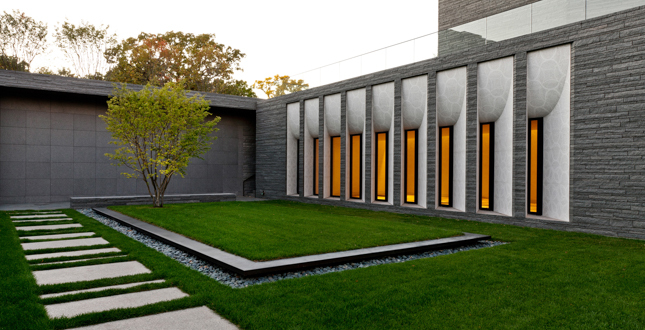 Close attention was given to coordinating views from interior spaces to the landscape beyond. 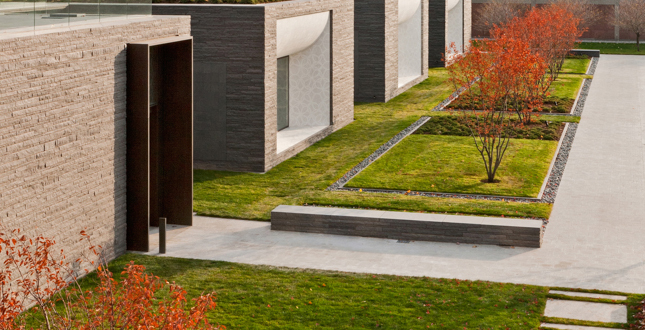 Subtle articulations on the ground plane and a simple plant palette create a sense of enclosure while extending the building’s geometries into the landscape. 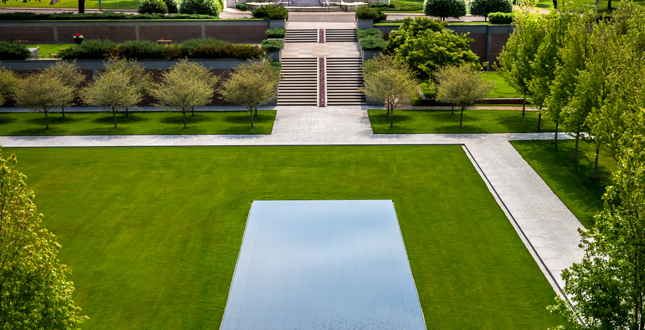 A reflecting pool acts as the organizing axis between the Chapel and the existing mausoleum. 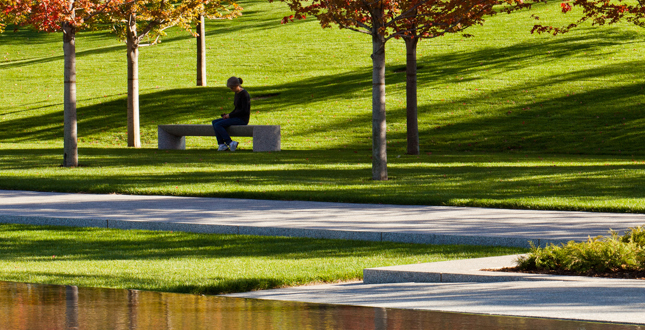 The formal relationship is reinforced by an allée of trees offering a secluded place for reflection. Additionally, Hawthorne trees ameliorate the existing outdoor crypt walls. Quiet reflection on an autumn day. 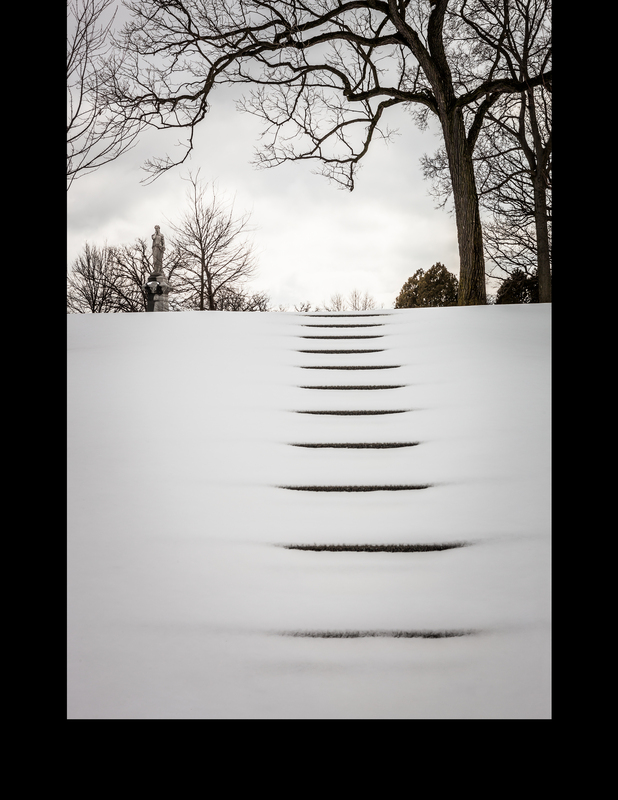 An invitation to the Cemetery beyond, the terraced lawn steps rest undisturbed in the winter landscape. 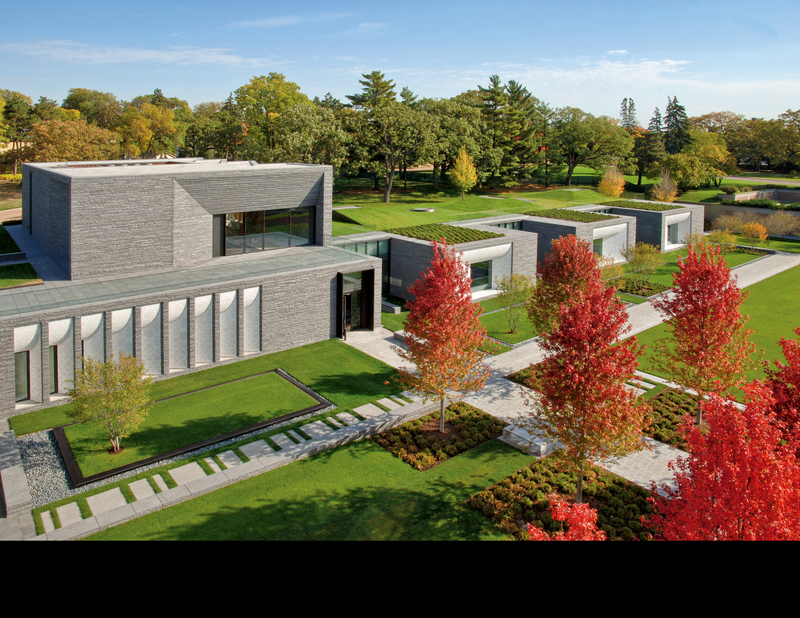 The 142-year-old Lakewood Cemetery faced a challenge: how to create a commemorative 21st century space within a revered, landmark setting. 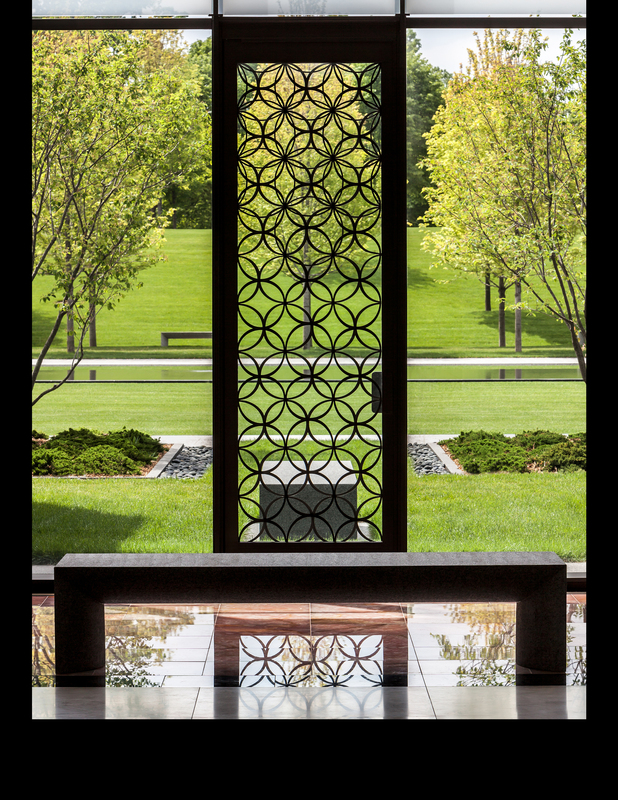 The Garden Mausoleum project meets this challenge adroitly, sustainably and gracefully. 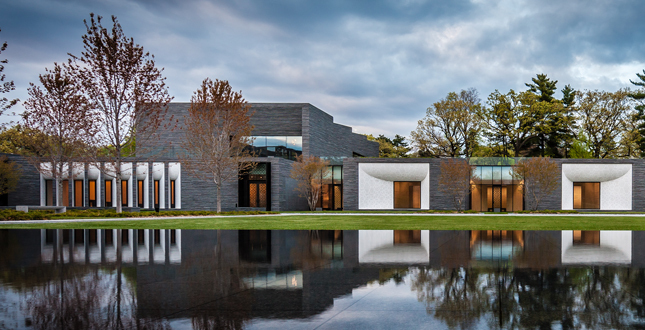 With the landscape enveloping two thirds of the building within a south-facing slope, architecture opens out onto an expansive, peaceful landscape with a quiet reflecting pool, groves of native trees and contemplative alcoves—a distinctly contemporary design in harmony with its historic environment. 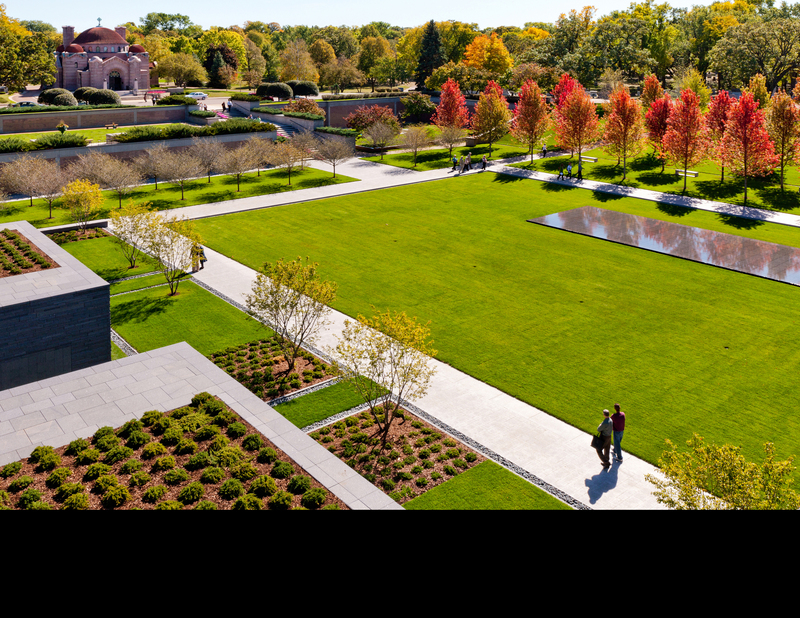 Lakewood Cemetery, established in 1871, is a quintessential American “Lawn Plan” cemetery, wherein broad sweeps of lawn are punctuated by a few fine stone monuments framed by trees and large serene lakes. This style was pioneered by Cincinnati’s Spring Grove Cemetery in the 1850s and Lakewood is the purest surviving example of this classic cemetery type. 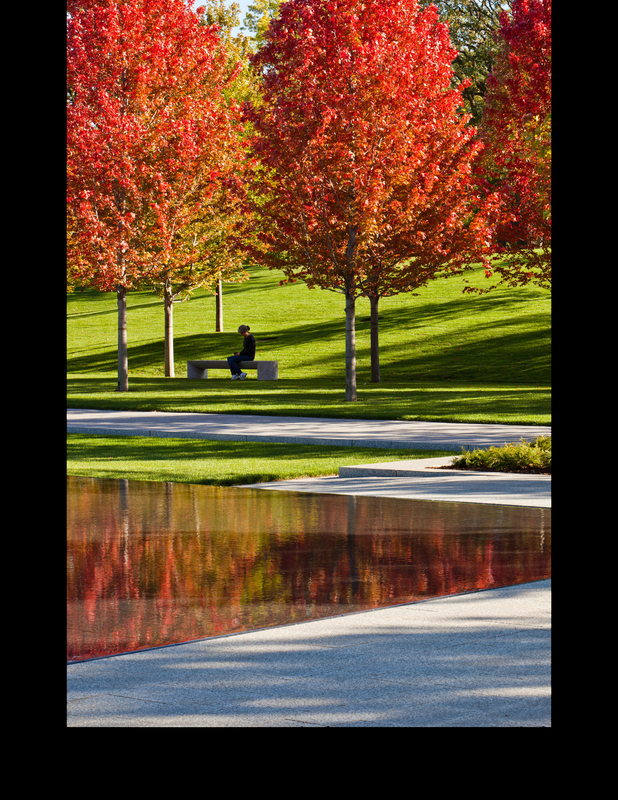 Recognizing the value and importance of their landscape, in 2002, the Trustees of Lakewood commissioned a team led by landscape architects to produce a Historic Landscape Report and comprehensive Landscape Master Plan. Their goal was to define the most important features of the cemetery and to guide future management and development. The problem confronting historic cemeteries nation-wide: how to generate continued revenue without impairing the values of their beloved landscapes. 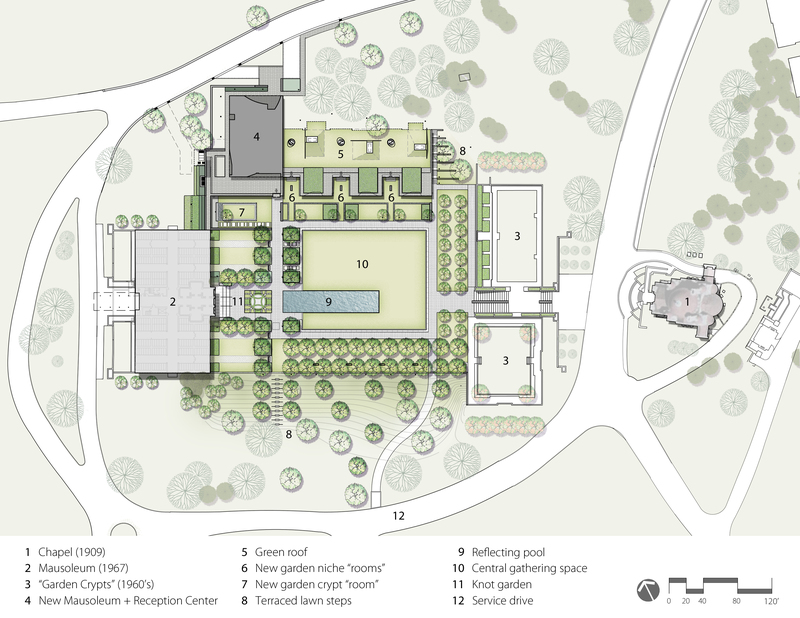 This planning effort grew into a on-going relationship with the Garden Mausoleum, the largest of several implementation projects undertaken to date. Working closely with the client, the landscape architect advised on the selection process for the architect and participated as a design team member from pre-design through completion. 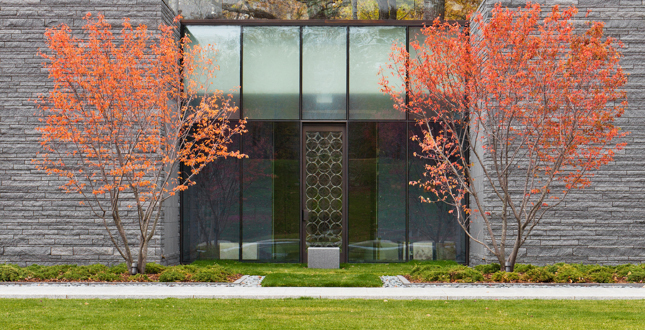 The result of this process is a profoundly integrated building and landscape design solution that transformed a deteriorated, “sunken” space, creating a poetic modern landscape offering solace and beauty in a setting rich with meaning. The site chosen for the new mausoleum was one of the few incongruous features in the Cemetery’s landscape. Near the cemetery’s entrance, surrounded by groves of majestic mature trees, the site consisted of a large sunken area, which served as the forecourt for a four-story-high mausoleum/columbarium building from 1967. A massive green space flanked by grassy inclines it was divided down the middle by rows of tall evergreen trees on the axis between the large mausoleum and Lakewood’s jewel like Byzantine-style Chapel (1909) at the opposite end. High, monolithic walls made up of “garden crypts” stood on either side of a monumental stairway leading up from the space to the chapel. The area as a whole had limited walking paths and no seating. 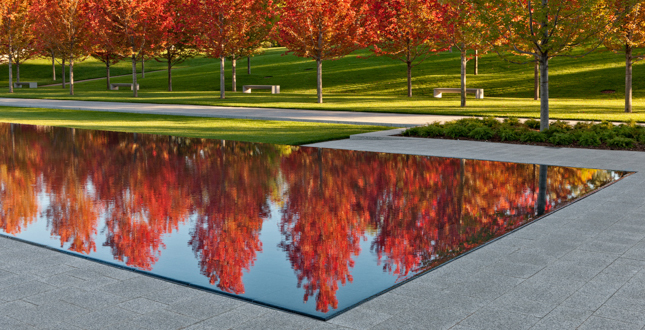 It did include a “Pool of Reflections,” a long rectangular water feature revered by cemetery visitors, but plagued with maintenance issues and when drained for the long Minnesota winters, a less than attractive landscape element. 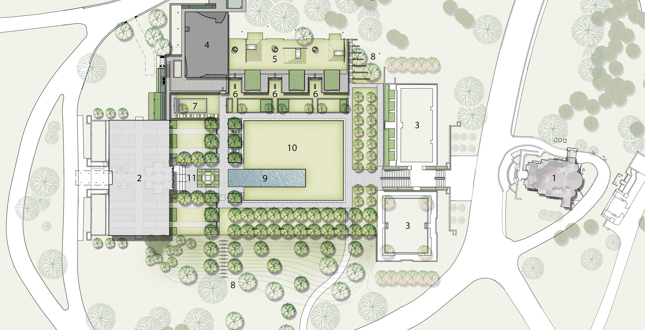 The master plan called for the siting of a new mausoleum and reception facility (to meet growing demand for cremation and above ground burial services) with minimal impact on the larger historic cemetery landscape. 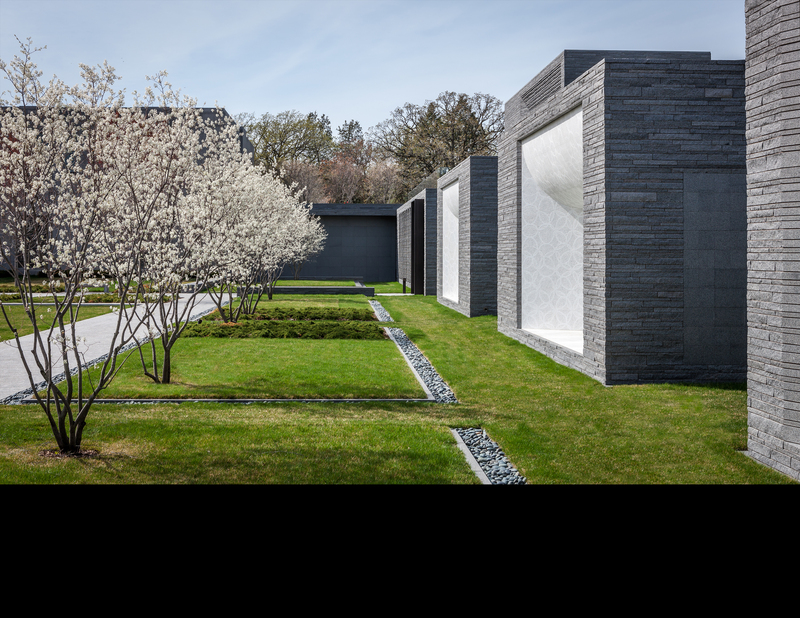 By creating a new central landscape space that is the unifying feature for the new & existing mausoleums as well as the iconic chapel, the landscape architect solved the problem of incorporating new program space in a seamless manner. 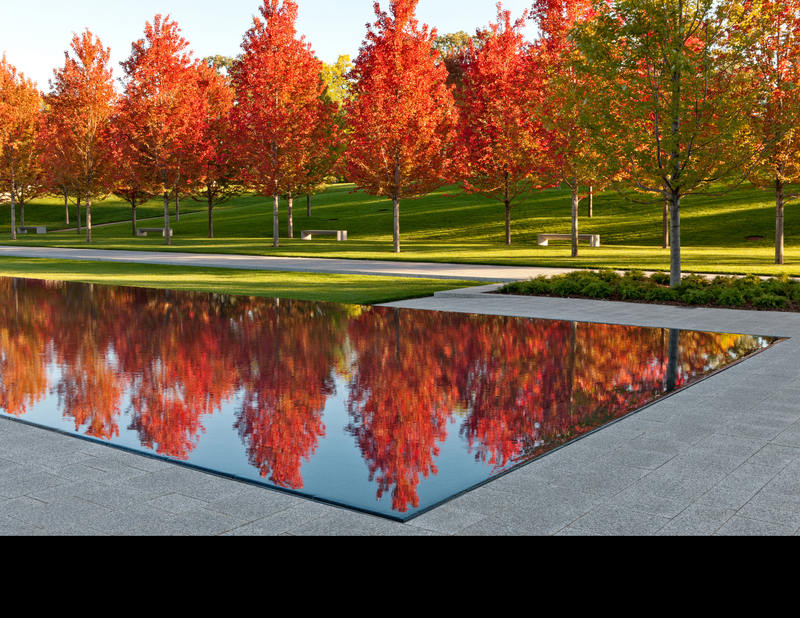 Providing an outdoor gathering/event space for large groups on Memorial Day, the new garden landscape—bordered by benches, solemn bosques of maples and hawthorns, and a redesigned, zero edge reflecting pool—also offers a space conducive to quiet contemplation, solace and healing. 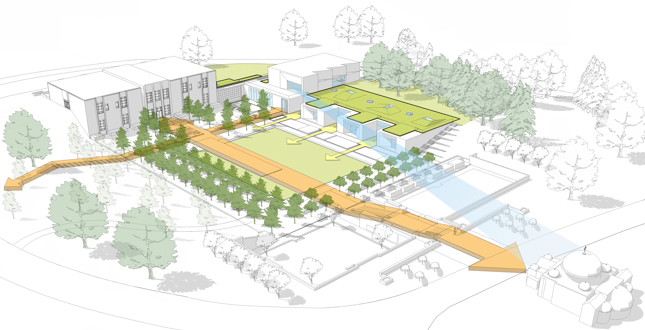 The principals of sustainable design were employed throughout the project from green roofs, to innovative storm water strategies, to diverted construction waste and extensive native tree plantings. The designers strove to create a project that minimizes its impact on the environment both visually and functionally. The design seeks to reuse existing cemetery space in a lyrical and compelling manner integrating program with a contemporary aesthetic harmoniously into an important historic landscape. 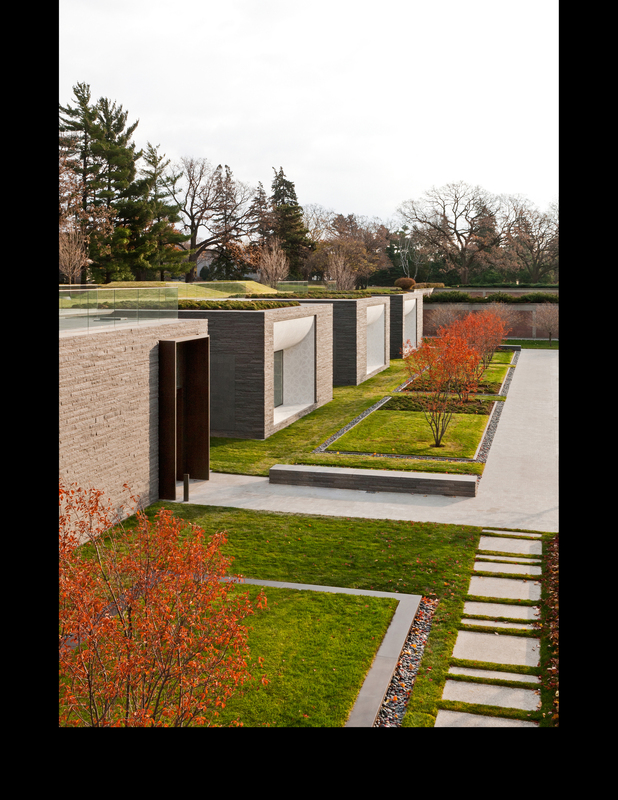 It accomplishes this by carefully defining building development to minimize impact on the larger Cemetery landscape and taking full advantage of a gently sloping portion of the site. 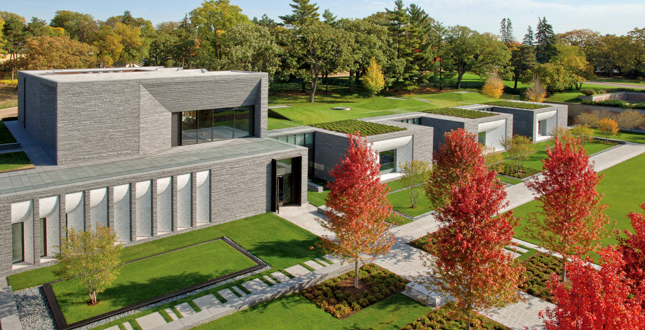 The strong geometry of the lower ground plane transitions gradually up the side slopes to the pastoral character of the “Lawn Plan” landscape above. The design establishes a unified relationship between interior and exterior space, heightening the experience of each. A clear hierarchy of spaces was provided, highlighting a large central gathering space while offering secondary spaces for contemplation. 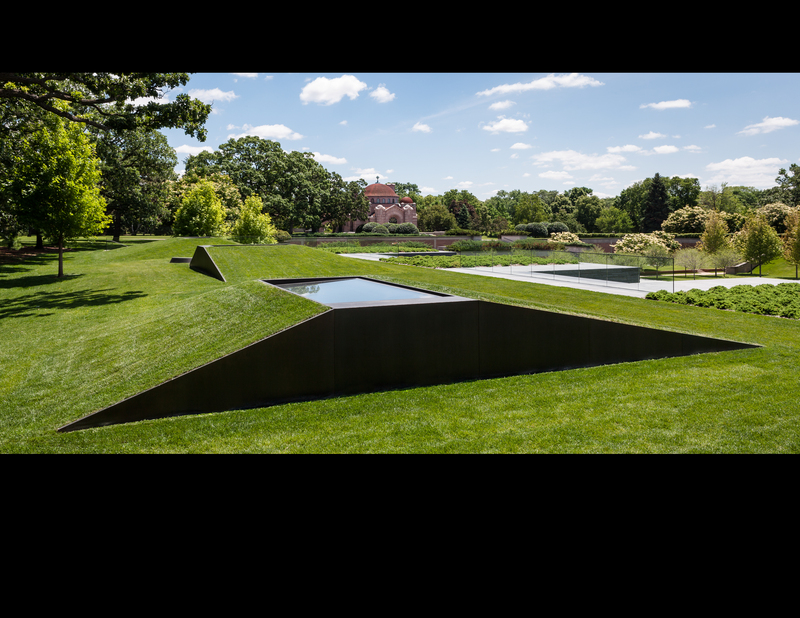 Asymmetrically placed, the zero edge reflection pool responds to import axial relationships among the built elements of this landscape while creating a dynamic visual center to the space. Strengthening the edges, groves of shade trees partially screen views of the 1967 Mausoleum façade. 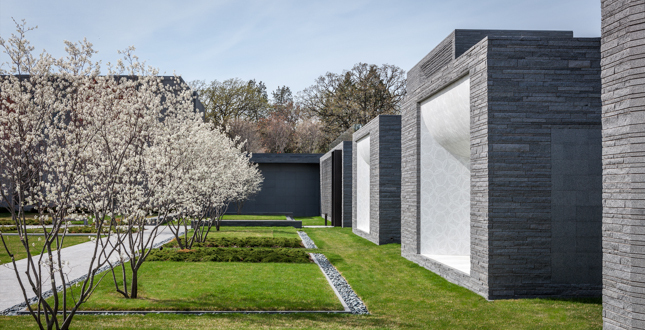 Low ornamental flowering trees preserve views to the iconic Chapel, while at the same time create a beautiful, soft edge that ameliorates the impact of the eastern garden crypt walls. 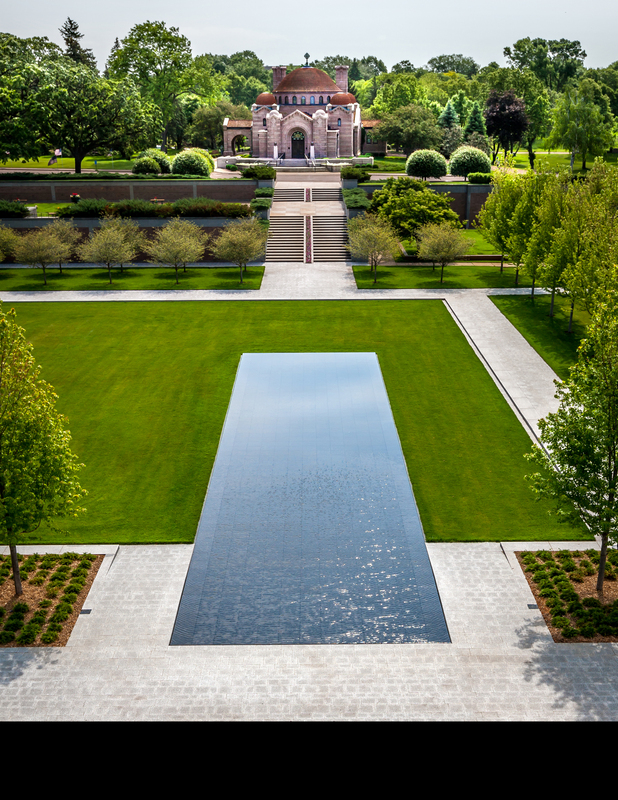 Lakewood Garden Mausoleum seeks to preserve the character of the historic landscape while creating dignified burial and commemoration space for as many as 10,000 people. With so much of the building program tucked into the hillside, considerable open space is conserved and visual impacts on the natural beauty of the surroundings were mitigated. Mature tree cover was preserved through air spading, root pruning and shoring with sheet piling. 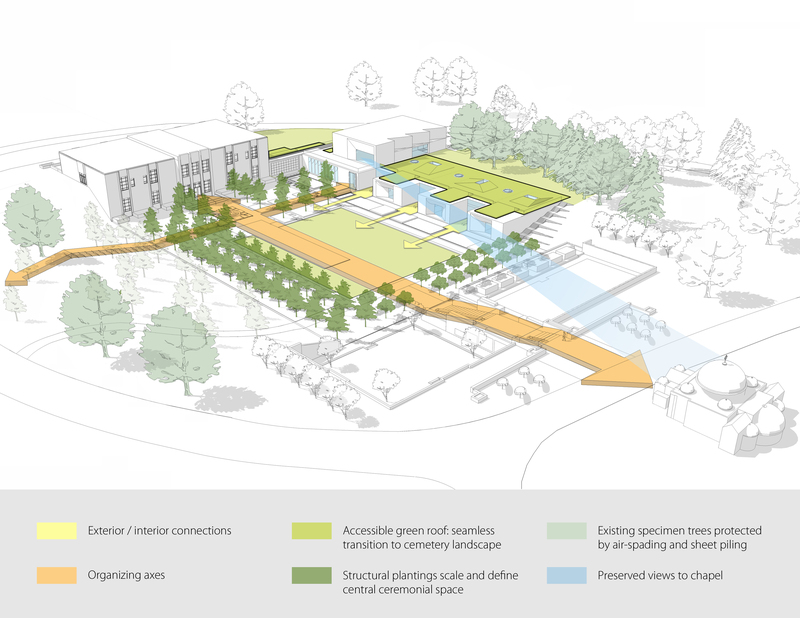 A new accessible green roof extends the open lawn of the surrounding cemetery with traditional benefits of carbon reduction, reduced cooling loads, generation of oxygen, heat-island reduction, and maximizing runoff infiltration. The building is oriented east-west to maximize solar exposure. Innovative storm water strategies were implemented maximizing on-site infiltration. No impermeable parking areas were created as a result of this development reducing storm runoff volume and rates. All parking is accommodated on existing surrounding cemetery roads. An on-site well was preserved reducing potable water use for irrigation. Numerous large trees and shrub/groundcover areas were planted to increase shade thereby reducing loss of water due to transpiration and evapotranspiration, improving water use efficiency. Locally-sourced granite with high albedo properties was used for the majority of landscape uses and on all paths in the lower garden. Site lighting was minimized to reduce light pollution. 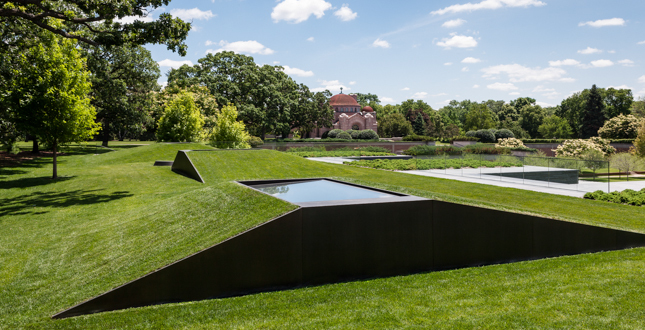 The Lakewood Garden Mausoleum landscape is significant as a contemporary design expression in a historic setting conducive to quiet, respectful reflection providing for fundamental human need with dignity and grace. The combined building and landscape has already been recognized by the Boston chapter of the ASLA and has received numerous architectural awards.